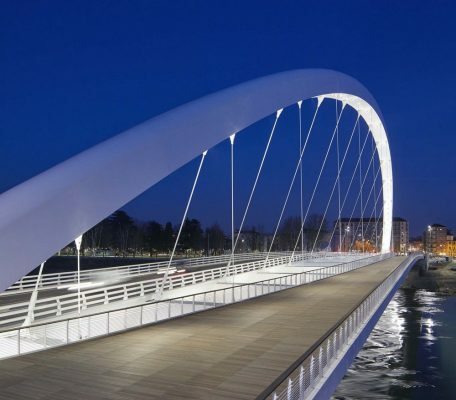 During the flooding of Alessandria in 1994, not only did the water level reach the roadway, but also the piers of the Napoleonic Cittadella Bridge caught much of the debris in the river, effectively acting as a dam. 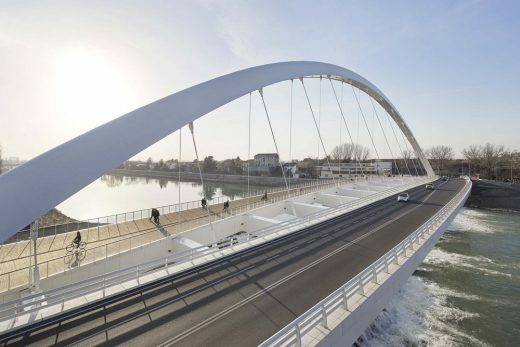 The new design, a single span raised above the flood plain, not only solves that problem, but also reconnects the fabric of the modern city with the Cittadella, an 18th century fort and tentative UNESCO World Heritage site. By relinking Piazza Gobetti to the citadel’s remarkable structures, the project hopes to catalyze their future preservation and reuse. 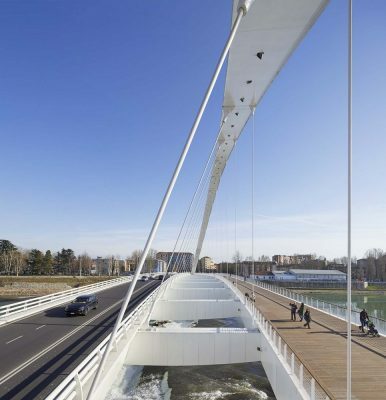 The bridge also enhances the natural flow of the river Tanaro, and aspires to become a public space for the citizens of Alessandria. 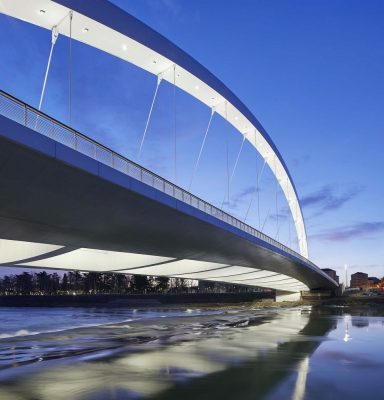 While the previous structure was often heavily congested with traffic, making it unsafe and virtually an obstruction for pedestrians, the new bridge provides separate parallel routes for pedestrian and vehicular circulation. 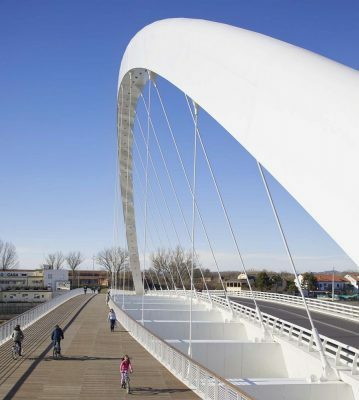 The pedestrian walkway effectively becomes a public plaza through which the public and civic life of Alessandria can find a new, positive relation to the river. 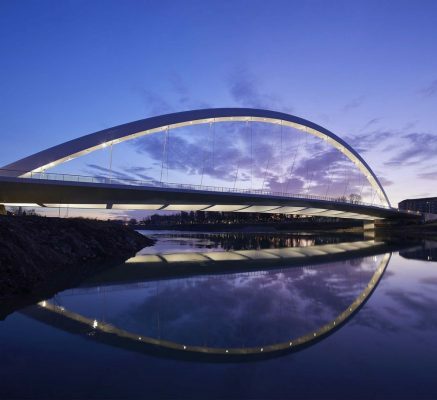 The vehicular side of the bridge bows strongly to the north, and as a counterbalance to this bow, the 32.5 meter high arch of the bridge is curved to the south. 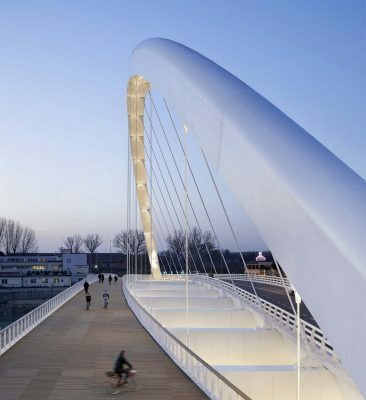 The weight of the pedestrian bridge helps to maintain the balance, and with the opposing curves, creates a dynamic arrangement. While the white precast concrete and painted steel structures highlight environmental changes across the site, and have become iconic reference points visible from many locations in the city, the porfido stone pavers to the sides of the abatement walls seamlessly anchor the structure to the traditional material palette of Alessandria’s streetscapes. Dante O. Benini, Founder and Chief Architect of Dante O. Benini & Partners Architects, comments: “The idea of the first bridge was conceived when Richard Meier decided to share the project with my firm in Italy, when our input back then was focused on the destruction and disaster that had occurred just a few years ago during the 1994 flood. 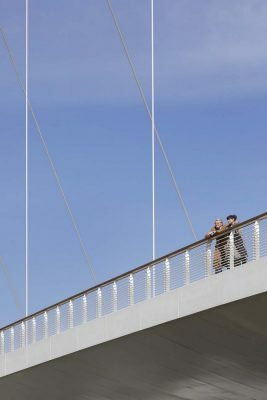 Richard Meier & Partners has designed and built a number of projects in Italy including the Italcementi i.lab in Bergamo, the Jesolo Lido Village, Condominium and Hotel in Jesolo, and the iconic Jubilee Church and Ara Pacis Museum in Rome. 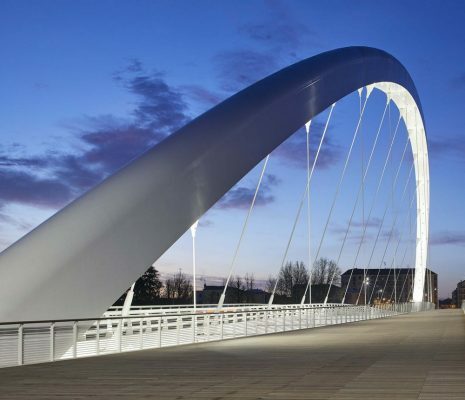 “We first began working in Italy, while designing the Cittadella Bridge and the Jubilee Church over twenty years ago, and we have worked together with the Comune di Alessandria to complete this important civic space for the city. 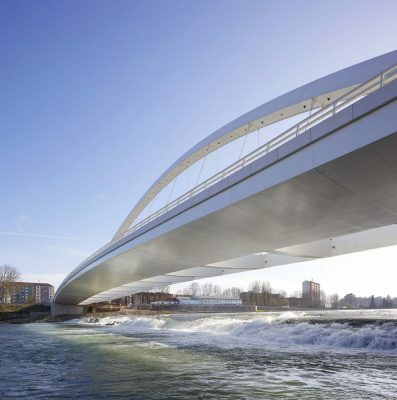 “As in many of our buildings, this project is a composition of volumes and forms, and at dawn and dusk, and with the change of the seasons light will filter through the structure providing for particularly animated light conditions. 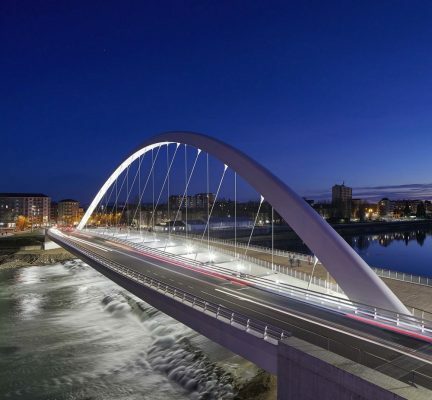 We hope the Cittadella Bridge contributes to the life of the city and takes advantage of the site.” states Mr. Meier.